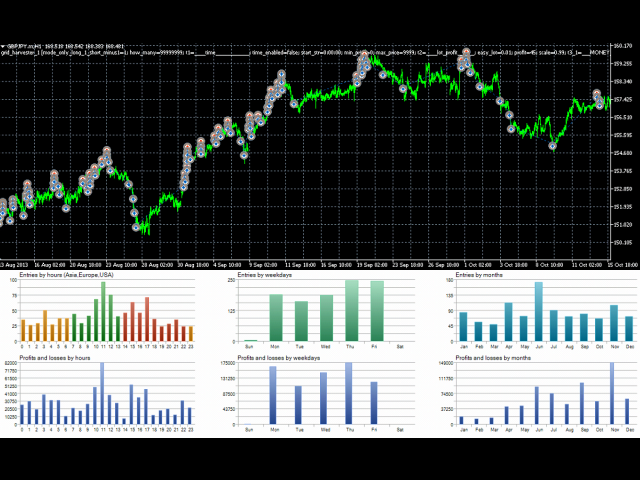 Grid Harvester is an advanced trading robot, that uses grid trading to harvest maximum out of trending and oscillating markets. This method of trading is often used to attain high percentage account growths by social traders on a highly unpredictable markets, where simple buy/sell robots are having hard time operating. It can be also used with greatly reduced risk for managing bigger accounts at safer levels. It uses the mathematical ratios to re-wight your position, making it possible to recover even if the course is not following initial entry point. 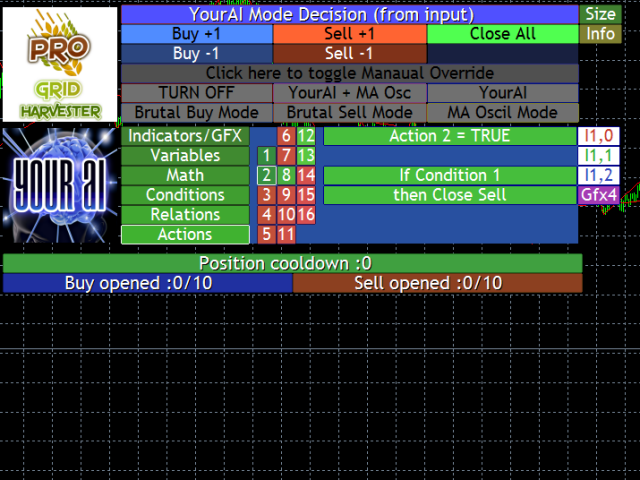 It has basic Buy and Sell modes, that are just performing buy/sell operations until the mode is turned off. It also allows for an Moving Average oscillation mode, that can focus better on oscillating markets. [OFF] - Manual BUY/SELL from panel - no automated buy or sell signals. Allows user to decide on BUY/SELL signals manually. [MA Oscillation mode] - mode designed to harvest short-term (smaller time-frames) and long-term (larger time-frames) oscillations. [Sell mode] - "brutal" sell mode. Same for SELL orders. [Buy mode] - "brutal" buy mode. This allows for continuous trading with BUY orders. (2.2) Lot size and Money Management - this option allows to always trade with same risk, even though the amount of funds is changing. If enabled and set to 1000 and your deposit is 3000, lot size will be increased 3x. 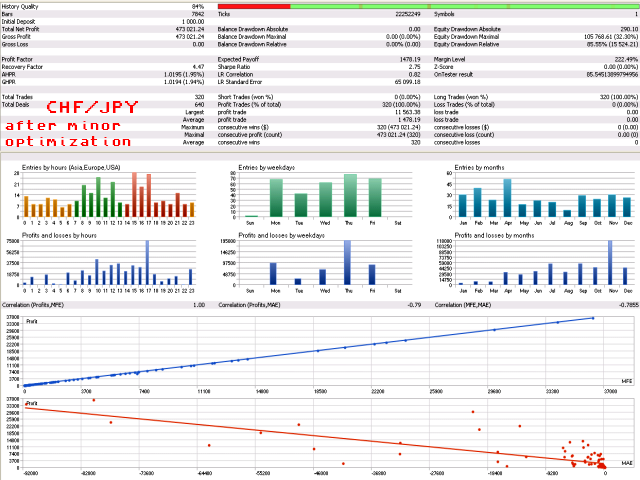 (2.3) Take profit options - important under BUY/SELL modes, but also work under Oscillation and YourAI. Optimize only first value. (A) Explore more when you are more advanced. 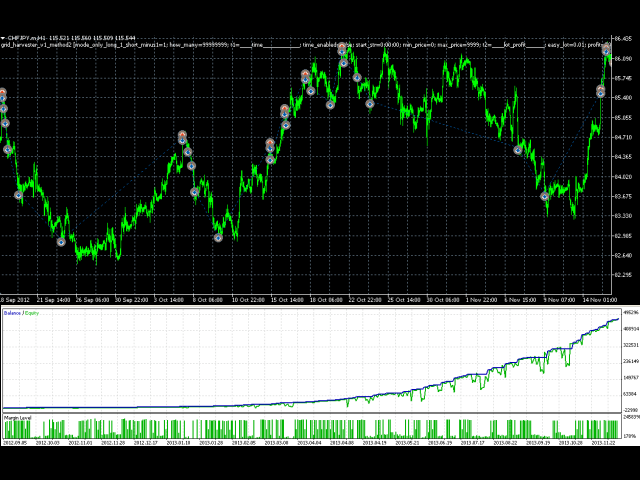 (3.5) Hedge and Stop Out - use (3) Stop Loss at equity percentage in combination with enabled (2.2) Money Management. Use 75 for stopping out when equity will drop to 75% in relation to state from before last trade. For more detailed PDF, Video Instruction/Tutorial - please check the comment section. 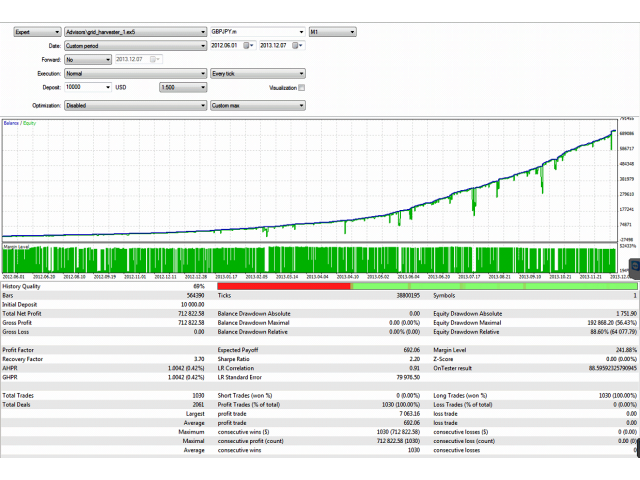 Expert adviser is not for novice users, it is designed for people that want to have as much control as possible over grid trading robot, without programming themselves. Please first play with and use the FREE version of the EA, to see if it is not too complicated for you. I use full versions for only half of my sets, FREE version is enough for more simple half of them. 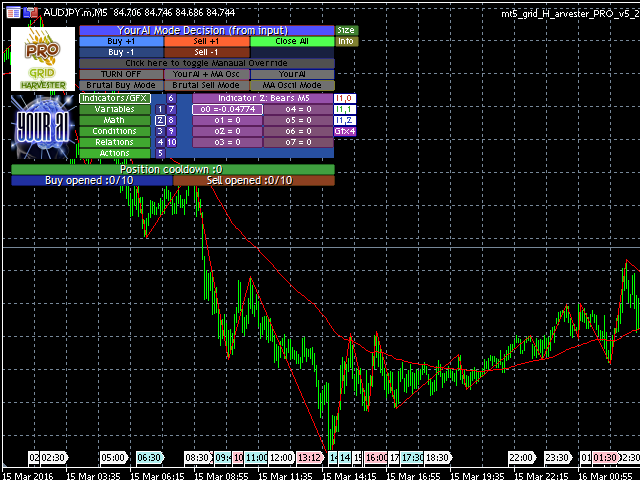 The strategy is in MetaTrader 4 and MetaTrader 5 versions and it supports hedge and non-hedge accounts. Очень нравится эксперт, а благодаря обучающему видео, которое предоставил автор, легко освоил оптимизацию, хоть и новичок в этом. Спасибо!! !